The Stromberg-Voisinet company was a direct competitor to two other Chicago makers of the so-called catalog guitars, guitars built cheaply to sell cheaply to the mass market. The products weren't Martins, but were better built from decent quality materials than many 'cheap' guitars of post WWII. Most were ladder braced, and are often seen in old images of rural guitar players both black and white. By the early 30s, Stromberg-Voisinet became the well known Kay company. "The Olympian Stands All Tests" is stamped on a small metal tag attached to the back of the 'ice cream cone' head stock. Although not marked Stromberg-Voisinet, the head stock shape with its embossed design easily identifies the guitar as a S-V product. The top is an attractive, rift-sawn, ladder-braced spruce, hence the atypical grain pattern. Back and sides appear solid birch, stained mahogany-red. The top is trimmed in black with white celluloid binding. The sound hole has multiple inlaid rings of b/w/b/w purfling. The 'V'-carved neck is likely poplar, topped off with the unique S-V 'ice cream cone' head stock shape, embossed on the reverse. Finger board is a dyed wood, with pearl position markers at frets 5, 7, 9 and 12. The tuners are original, and we've only seen this variety on S-V mandolins before. It appears the tuners were inserted into the head stock cavity before pressing on the celluloid buttons. They're covered on top, still function quite well even though string pressure over time has caused a few to be off center. The bridge is a dyed wood with a fret-wire saddle, now, post neck set, superseded by a thin piece of steel rod. Scale length is a short-scale 24 1/8", and the neck measures 1 3/4" across at the nut. The lower bout measures 13 1/4" across at its widest, and 3 3/8" deep at the end pin. This guitar, although a lower end offering, has remained in remarkably pristine, original condition, and has some nice appointments. There is no evidence of any prior repairs, and only a neck reset and fret level/dress was needed to get in into top playing condition. There is some top wrinkle at the sound hole, typical on many ladder-braced guitars. Action is set at 5 and 7/64", and the guitar plays easily. And what a great sound! Nice ladder-brace bark and treble ring, and a good bit of oomph in the lower end, too. 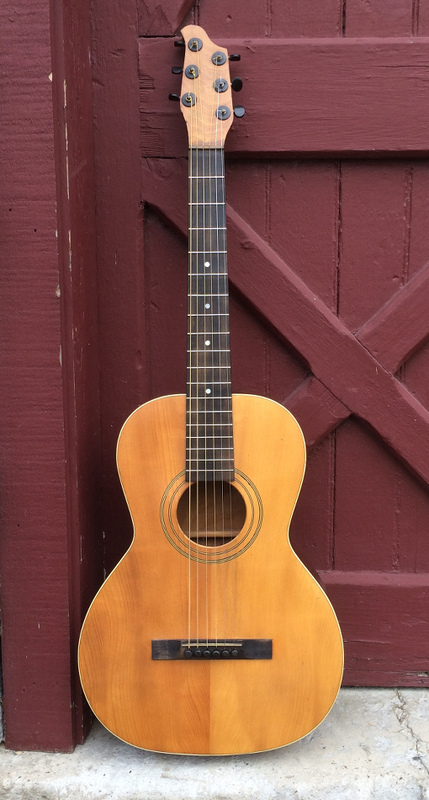 One of the more fun little fingerpickers we've offered recently, and attractively priced.